Our global temperature continued its upward trend last month with July 2015 marking not only the warmest July on record, but the warmest month ever recorded for the entire planet. According to a report by NOAA’s National Centers for Environmental Information, Earth’s combined average temperature for the month – over both land and sea surfaces – was 61.86°F, which is 1.46°F above the 20th century average. 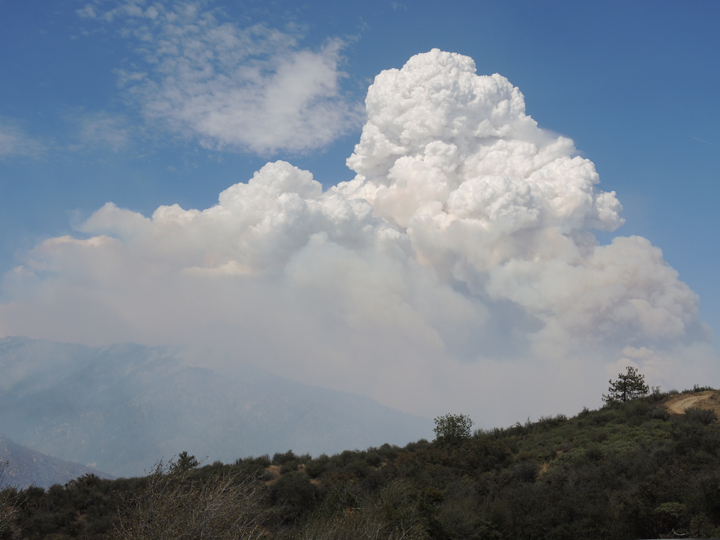 It surpassed the previous record set in 1998, which was also an El Niño year, by 0.14°F. July 2015 also marked the 39th consecutive July that our global temperature was above its long-term norm. NOAA says that July – which is climatologically the planet’s warmest month – has been getting hotter over the years. Records show that the temperature for the month is currently increasing at an average rate of 1.17°F per century. For the oceans, the globally averaged sea surface temperature for the month was 1.35°F above the 20th century average of 61.5°F. That is the highest departure on record for any month. According to NOAA, the ten highest monthly departures from average for ocean temperatures have all occurred since April 2014. While heat dominated most of the planet in July, some places were particularly warm. Heat waves in Europe pushed temperatures to record levels across the region. In fact, it was the warmest July on record for both Austria and Spain. Here in the contiguous US, temperatures were slightly warmer than average, but no state set a new record high. This difference highlights the fact that climate change is a complex global phenomenon that involves much more than what is happening in our own backyards. Year to date, the first seven months of 2015 were the warmest of any year on record. Global temperature records date back to 1880. It’s official! We’re having a heat wave in New York City. While we have hit the 90°F mark a few times already this summer, this is the first real heat wave of the season. Actually, it is the first official heat wave in the Big Apple since 2013. The threshold for what constitutes a heat wave varies by region, but here in the NYC area it is defined as three consecutive days with temperatures reaching 90°F or higher. In Central Park, the temperature reached 92°F on Saturday, 93°F on Sunday, and today it climbed to 95°F – tying the record high for the date. When factoring in the high levels of humidity these past few days, the heat index felt like it was near 100°F. While these conditions are oppressive, they can also be dangerous. Both a heat advisory and air quality alerts were issued for the city. For most of the summer, temperatures have been running slightly above average in NYC, but it is interesting to note that there has not been much extreme heat. To date, we have only had ten days with readings at or above 90°F. On average, we typically see fifteen for the season. For the continental U.S. as a whole, the hottest part of summer arrives in mid to late July. On the regional level, however, there are significant differences in the timing of the hottest part of the season. 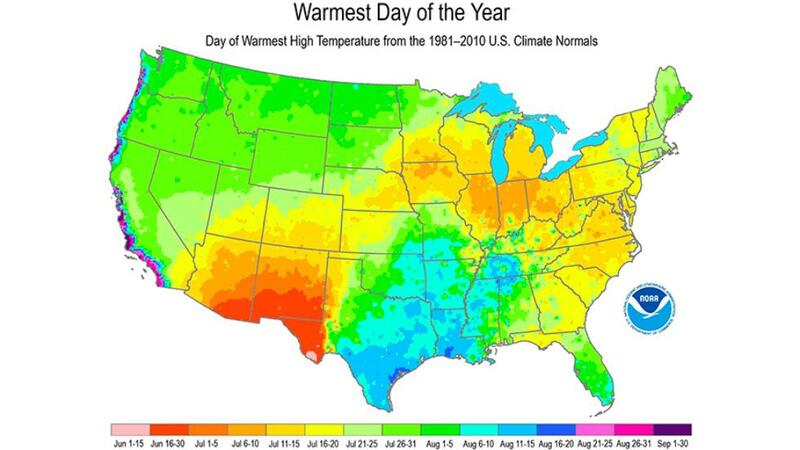 Based on historical averages, NOAA’s National Centers for Environmental Information (NCEI) produced a map showing how the warmest days of summer vary across the country. The desert southwest, for example, is an early bloomer in terms of heat. It’s warmest days typically arrive in June. 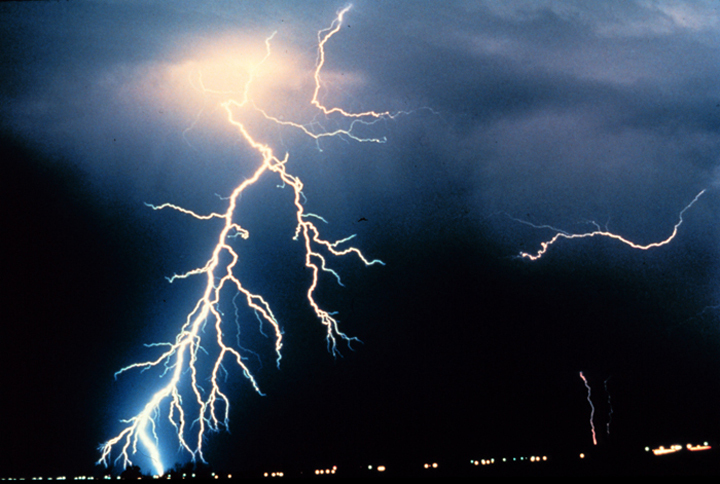 By early July, the North American Monsoon – a seasonal shift in wind direction – kicks in and helps keep the region relatively cool and rainy through September. In parts of the south central states, a persistent area of high pressure typically builds over the region in August. This limits cloud formation and dries out the soil, which helps to send temperatures skyrocketing. On the other far end of the spectrum, temperatures along the west coast do not peak until September. This lag is the result of hot air rising over interior deserts and cool Pacific air flowing in-land. By September, this upper-level wind pattern usually weakens and allows warm air to flow toward the coast. While the NCEI map is derived from long-term climate averages, it is important to note that short-term variability can cause the date of peak temperatures to vary in any given year. 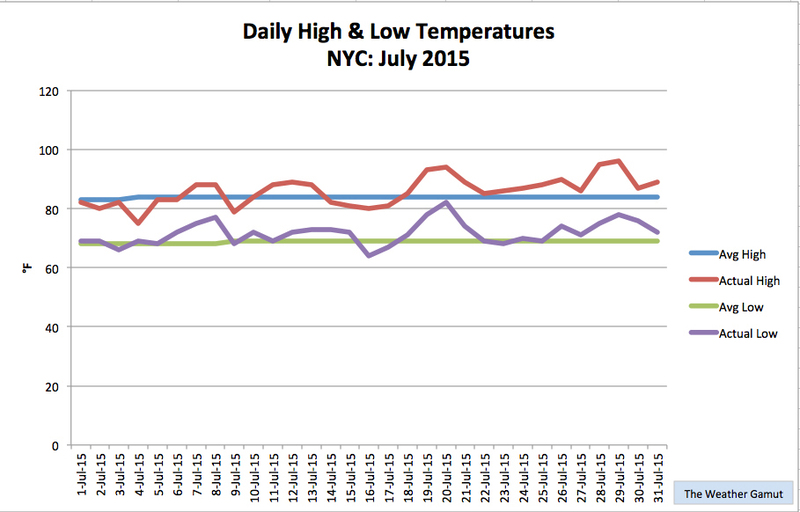 July is normally the warmest month on the calendar for New York City, and this year was no exception. Despite getting off to a relatively cool start, the month brought us five days with temperatures in the 90s. These hot days helped bring the city’s mean temperature for the month up to 78.8°F, which is 2.3°F above average. While we had a few stretches of very warm and humid days, including some where the heat index reached the triple digits, it is interesting to note that we did not technically have a single heat wave all month. In this part of the US, a heat wave is defined as three consecutive days with temperatures reaching 90°F or higher. On the precipitation side of things, NYC was mostly dry. In all, we received 3.98 inches of rain in Central Park, which is 0.62 inches below average. 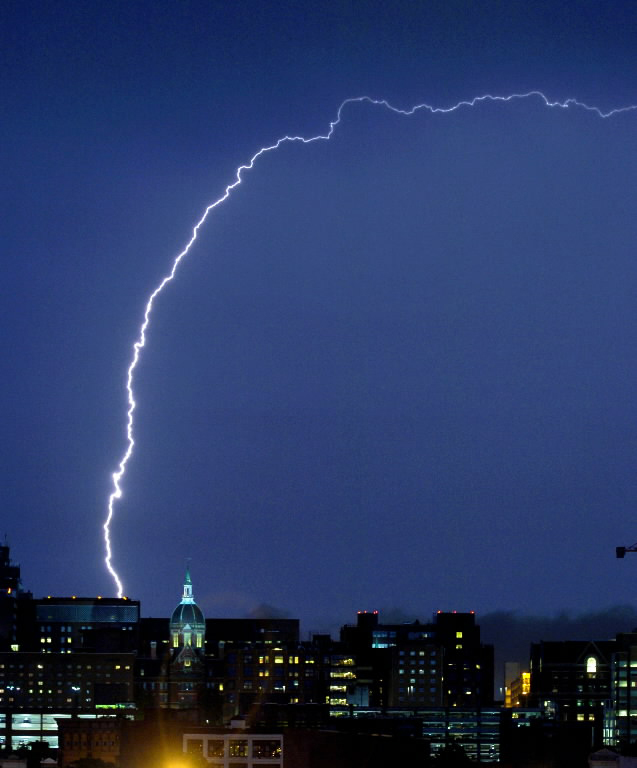 Of this total, 1.95 inches fell in a single day as a cold front moved through the area triggering thunderstorms and intense downpours. 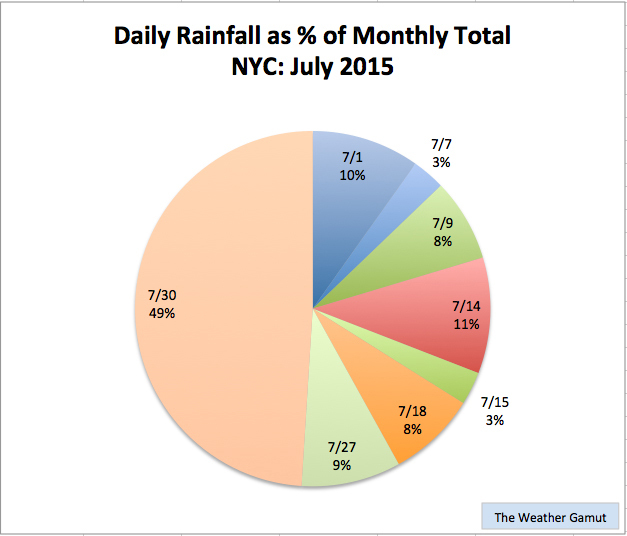 July is typically the wettest month of the year in the Big Apple.